When Nicola Richards was young, like so many others she LOVED Michael Jackson’s ‘Thriller’. So much so that her parents ended up hiring the Making of VHS from the video shop for her to watch. It was the perfect introduction to prosthetic makeup, and ignited her desire to become a makeup artist. They hired it for me so much that the video store owner gave them the copy and ordered another one from his stockists as no one else ever had a chance to rent it! Nicola has worked as a hair and makeup artist in film and television for over fifteen years, but this is only half her journey. She is also known and loved as director of one of the leading makeup suppliers in Australia, ‘The Make-Up Foundation’. Originally from the UK, she moved her family to Australia in 2008 with a desire to pursue something fresh. Having already established a successful supply business in the UK, Nicola decided to completely move the business to Australia, a risk that paid off. Ten years later, and The Makeup Foundation is still thriving and expanding into territories. Nicola’s new special effects range Ripper FX is on everyone’s lips at the moment, so I wanted to know more about her journey from there to here. ‘I trained at the London College of Fashion in Make-up and Hair for the Performing arts which was 5 days a week full time for 3 years. Some days hardly anyone would turn up to class! On one particular day only myself and 1 other girl turned up to our wig class. Our tutor, Mandy, was off to the studios to film a live chat show after class, and being cheeky, I asked if we could tag along. To my astonishment she said yes. When we turned up the show was “So Graham Norton” (Channel 4, 1997). We met the designer Marella Shearer and she put us straight to work. My actual first makeup that night was on Joan Collins with Marc Almond from Soft Cell being my second. I had never met a celebrity let alone made one up. I was so nervous, and it was sink or swim. What’s been your favourite job/experience so far working in film and tv? ‘One of my favourite jobs was a TV drama re-make called “Auf Wiedersehn Pet”, my first fully paid assistant job after my internship with the BBC. I had met the designer on the internship and as soon I was released she asked me to join her as an assistant. The job was modern day and started filming in a traditional industrial town in Northern England called Middlesbrough. The locations were grubby but fun. The job only got better as it was also going to film for 6 weeks in the United States. However, whilst we were filming, 9/11 happened and this had a major impact on production plans. We were granted work visas but 9/11 spooked people and some crew refused to go or wanted to delay. This was the case for our Makeup supervisor, so I actually got to go in her place. It was a great opportunity for myself, as I got to be involved in production meetings, fittings and got to stay in the most amazing hotel in Phoenix, Arizona. It was a very plush hotel, and my room was bigger than my whole apartment in London. As I had really just stepped out into the industry I thought this was amazing. The adventure only kept getting better. The locations were amazing in the Arizona desert during the day and experiencing living in a cowboy town in the evening. We had the opportunity to film with real Navajo Indians in their community and experience their celebrations and also be involved in a traditional medicine man blessing. I actually looked after the medicine man for the duration of the filming and at the end of filming he gave me a necklace which I still treasure today. We even visited Las Vegas for a weekend getaway, getting lost in a snow blizzard in the Utah mountains driving from Lake Powell. What made you want to start The Makeup Foundation when you came to Australia? ‘My husband (who is a grip) and I worked constantly but were always travelling on separate jobs all over the UK & Europe. We just wanted to spend more time together and start a family so decided to emigrate to Australia. We didn’t want to jump straight back into the film industry, so thought maybe we could supply it instead. We had actually started The Make-Up Foundation in the UK in 2006 as a trial and built a pretty steady business considering we also worked film jobs full time. Tell us about your recent Ripper FX range and why you wanted to expand into special effects products? ‘We have always evolved with the products we stock and the direction we are going in. Ripper FX was a natural progression. 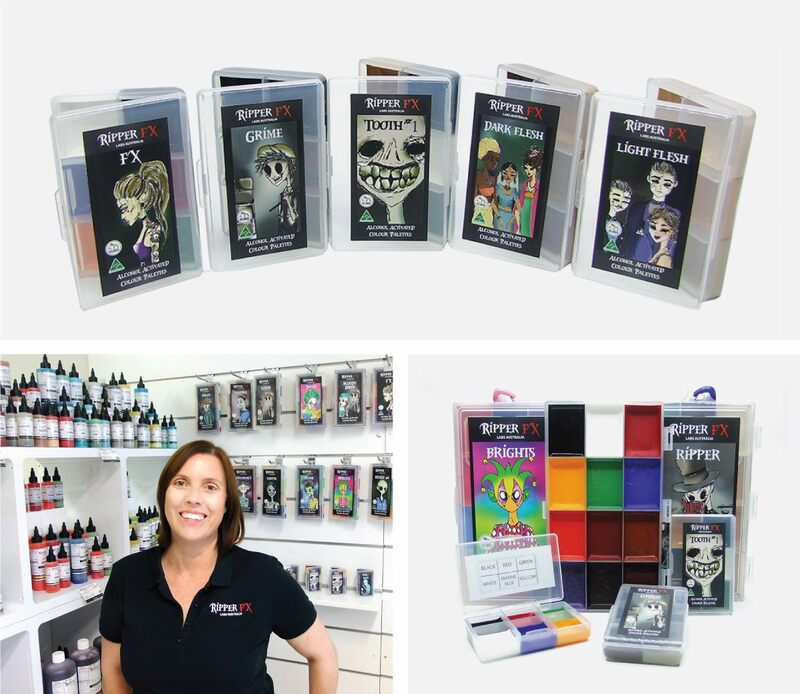 We’ve been supplying school kits for over 9 years for standard makeup and over the last 5 years we have been sourcing FX products for those kits too. Since launching the Ripper FX range, Nicola’s brands products have been at the forefront of many productions coming to Queensland, such as Thor: Ragnarok and Aquaman. The Ripper FX palettes, in particular, were customised and are currently being used as a favourite by the team on ‘Danger Close’ which is currently filming on the Gold Coast. Nicola also had great success exhibiting at London IMATS last month, where she secured additional stockists such as PAM London and Bela Kosmetik Germany. What are the products that you are most proud of? Lastly, what advice would you give to artists entering this industry? Crowd rooms are a great way to meet designers and artists. Those that work well in a team, ask questions, help and look interested are usually the ones who end up with trainee recommendations when people move on to crew up their own jobs.